Staircase Design - "Post to Post" or "Over the Post"? 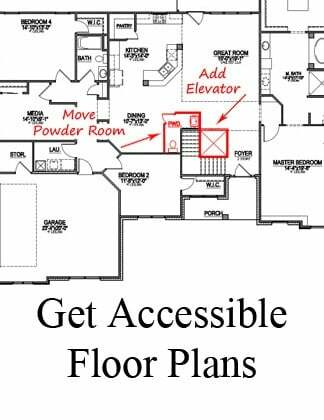 Staircase style and design options can be overwhelming, but understanding two of the basic systems can make your custom home staircase design decisions much easier! The staircase is often placed within view of the foyer, so it has the ability to make or break a first impression of your home. So, what's the difference between a Post to Post and an Over the Post design? Here's the basics. In a post to post staircase design, the handrails run between two newel posts. "Newel posts" are the column that support the balustrades and handrail. 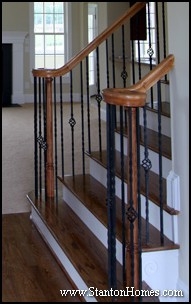 Pictured here are box newel posts and wrought iron balusters with an alternating basket design. The grey and white painted posts and handrail give this home a more contemporary feel. These color choices contrast with the more commonly used oak wood finishes. In an over the post staircase design, the handrails run over the newel posts and the balusters are fitted into the handrailing. Pictured here is a volute over the post system. A "volute" design consists of a spiral at the ends of the handrail. A bullnose step is required for a volute over the post design. 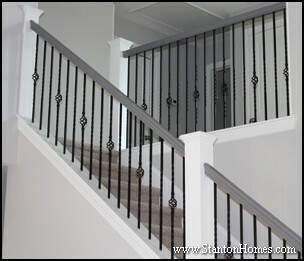 This staircase incorporates the popular trend of wrought iron balusters with alternating baskets. 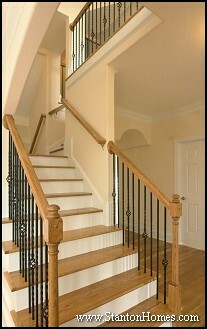 This oak and iron staircase design style is more formal and traditional than a box newel or craftsman style staircase. Find out more about staircase design ideas here, or ask your Raleigh custom home builder to help you design a staircase that reflects YOUR taste and lifestyle! Staircases are often visible from the foyer, so you'll want to make a good first impression with your staircase design choices. Check out these popular custom home staircase styles, from traditional to craftsman, wrought iron and more. This wide-step staircase is set to the side of the open Foyer, with wrought-iron balusters and oak handrails that further extend the spacious feel. A staircase can be designed to be open and inviting, particularly when the staircase is part of a two-story or vaulted Great Room or Family Room. 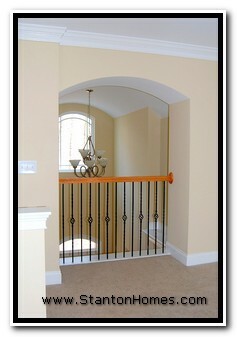 Using carpet in this custom home was a cost effective way to add oak detailing and wrought iron balusters. 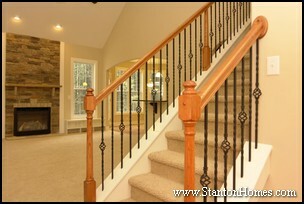 The iron balusters add touch of elegance and permanence to this staircase. A newel is the "anchor" post, the main column that supports the handrail. 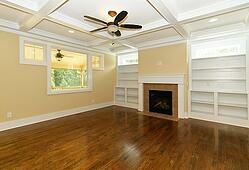 Newels can be custom designed for the homebuyer by the trim carpenters or staircase specialists. Newels can be boxy or round, small or large. 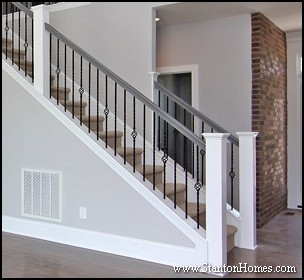 Pictured here is a Stanton Home with box newel posts in a post-to-post staircase system. 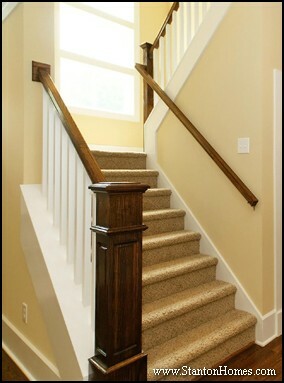 An interesting newel can really change the look and feel of your staircase. 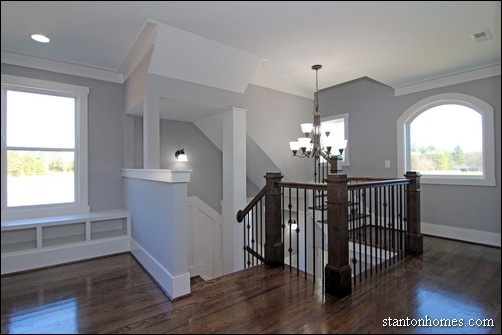 This custom home features a craftsman style staircase with a box newel post system. 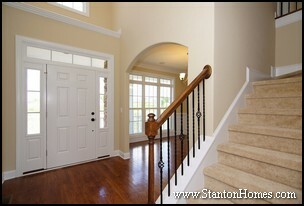 Craftsman staircases are simplistic and timeless. 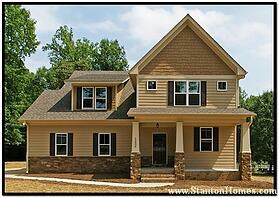 Craftsman style homes are favored by those who enjoy clean lines and solid structures, with a sense of elegance. 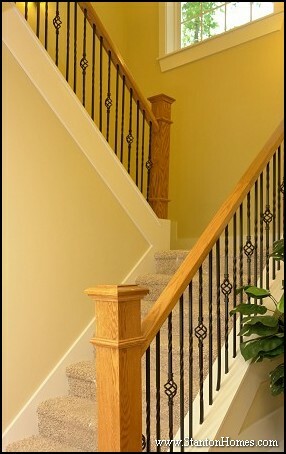 On an Open Tread Staircase, balusters are placed directly into the top of the stairway treads, as pictured here. Alternating baskets with standard balusters adds visual detail and avoids monotony. A typical oak newel post supports the oak handrail. The opposite of an Open Tread Staircase is a Kneewall Staricase. In this Kneewall Staircase, the balusters are installed into the closed stringer. This Over the Post staircase features Volute style posts with delicate, intricate wrought iron details. A Volute post spirals at the bottom of the stairway. These posts require a starting step. With a multitude of options, the staircases in your new home can truly reflect your own personality. 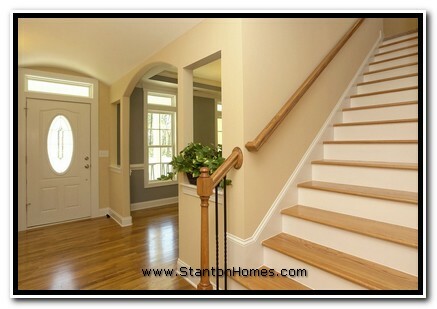 Contact us about the home you have in mind, and ideas for your Raleigh Custom Home staircase. 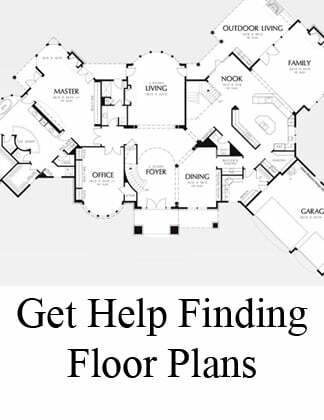 We can work with you to modify nearly any floorplan to incorporate your unique style and needs. 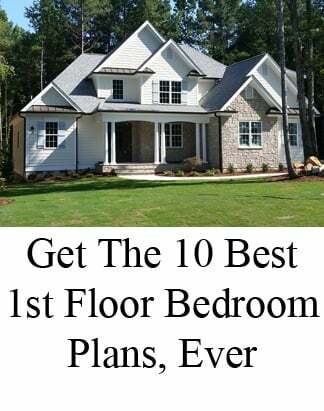 Or sign up for our monthly newsletter for more great tips on new home trends and ideas, with a special focus on the Raleigh NC area. 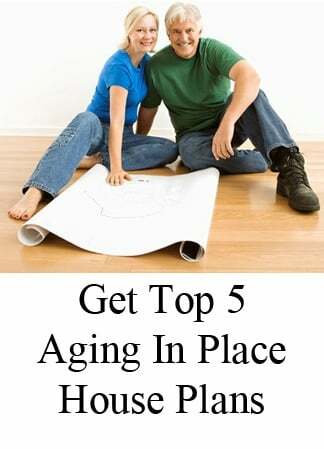 Want to read about other New Custom Home Trends? What, exactly, is a Barrel Vault Foyer? A barrel vault foyer offers a unique, arched ceiling treatment and can be used to accentuate many different styles of architecture. In this Arts and Crafts custom home, a barrel vault foyer draws the eye upwards, and adds a dramatic touch to the first room in the home. Height doesn't matter. Barrel vault foyers can be either one story or two story foyers. In this photo, the barrel vault foyer is even more impressive with the addition of an inset plant shelf on both sides of the upper foyer. The arched picture window with prairie style grids perfectly follows the signature curve of the ceiling. A home with a full height, two story foyer feels grand and luxurious when completed with a barrel vault ceiling. 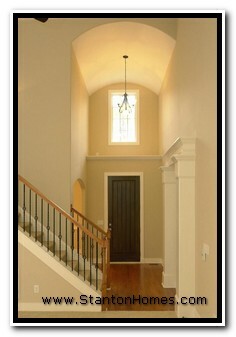 This is a great example of how a typical rectangular window can add appealing contrast to a barrel vault foyer ceiling. The window helps emphasize the clean, crisp lines of the built-in plant shelf and decorative columns. The barrel vault ceiling coordinates perfectly with the arched opening to the Formal Dining. 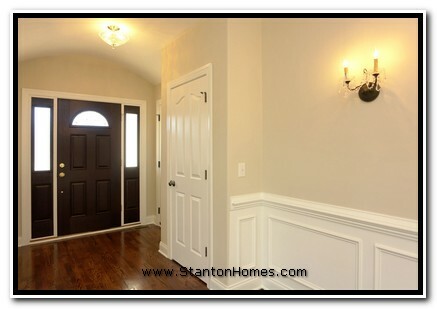 A shallow barrel vault ceiling can even add interest to a lower ceiling in a more typical foyer. The barrel vault foyer in this Craftsman/traditional home brings more attention to the marvelous arches and cut out openings throughout the first floor. No matter what type of custom home you're considering, a barrel vault foyer may be just right - and as you can see, the foyer can be charming, impressive, or somewhere perfectly in between! How Tall Should Ceilings Be?